Visit Park Güell, Antoni Gaudi’s flamboyant creation and one of the most famous UNESCO World Heritage Sites in Barcelona. Enjoy a hassle-free visit while saving both time and money! With these timed entry tickets, you will be able to access the Monumental Zone of the park at ease, without having to wait long in the ticket line. Enjoy priority access to Park Güell, one of the finest and most lively modernist parks created by Antoni Gaudí, an architect known for being a pioneer of Catalan Modernism in Barcelona. With this ticket, you will be able to enter the Monumental Zone, an exclusive zone in the park that houses some of Gaudí's best works, including the Hypostyle Room. The timed entry tickets ensure that you will be able to enter the Monumental Zone at a specific time and that you won't need to wait in long queues to purchase tickets to this highly frequented attraction in Barcelona. 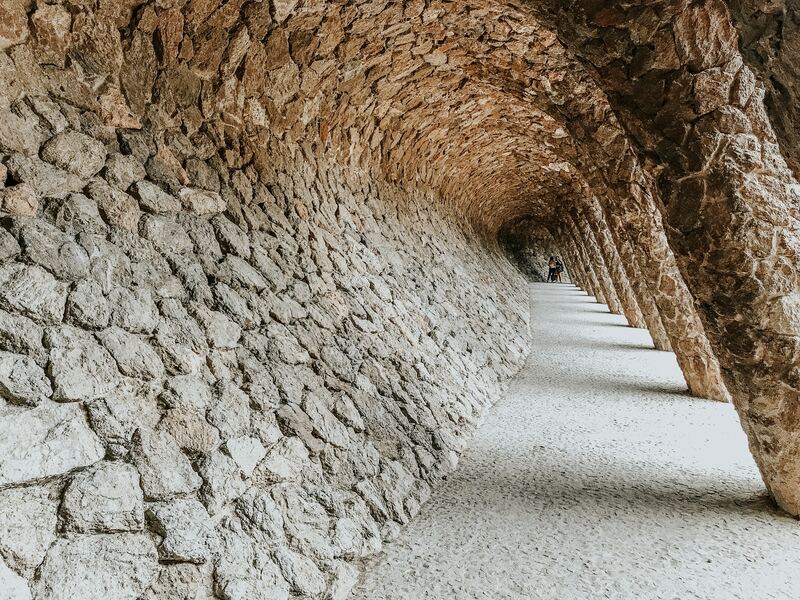 Originally intended to be a gated community for aristocrats, Park Güell is a burst of Gaudi's imagination come to life in the form of a public park. 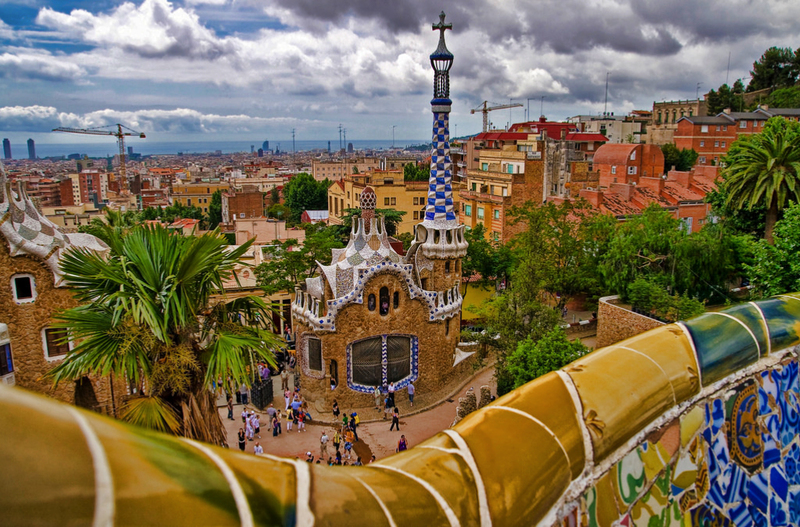 Positioned at an apt vantage point in Barcelona, this iconic park has quirky buildings, lush parks, and unique details that amuse even the most cynical visitor. With your timed entry ticket, you can visit the Monumental Zone, which requires ticketed access. Making up 5% of Park Güell, the Monumental Zone houses Sala Hipòstila (the Hypostyle Room), Museu del Guarda (Guard Museum), Jardins d’Àustria (Gardens of Austria), Plaça de la Natura (Nature Square or terrace), Pòrtic de la Bugadera (Wash House Portico) and interesting roads, viaducts and paths that one must see to believe! 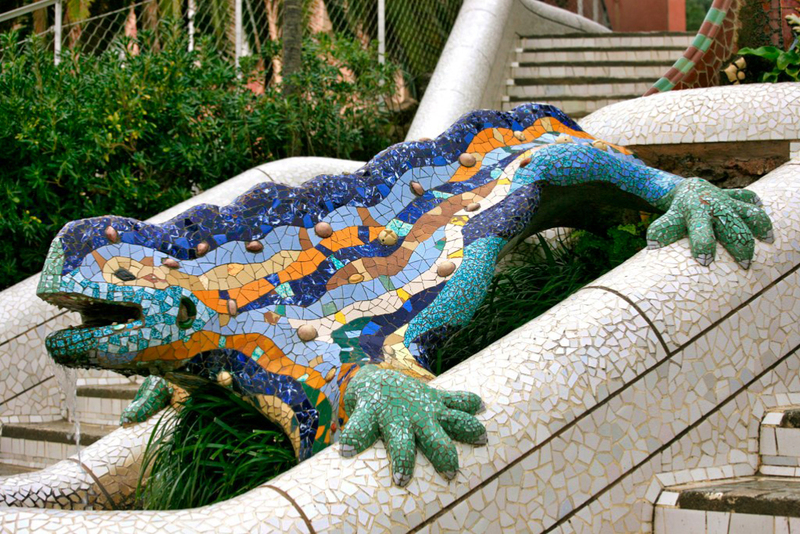 The exquisite lizard figurine that welcomes you into Park Güell - an adequate representation of the burst of color you can expect within the park! A view from Plaça de la Natura that showcases Gaudi's incredible vision. The impeccable ceilings in the Hypostyle Room. Straight out of any fantasy-fiction novel, this is the Portico de la Lavandera, an incredible viaduct, one of many in Park Güell. Park Güell is easily one of the most popular attractions in Barcelona, receiving over 5 million visitors annually. With a limited number of people allowed inside in each timed entry slot, ticket purchase lines at the venue can be anywhere between 1 to 3 hours long and, should you manage to purchase a ticket, your entry may be for a time that is hours later. Purchasing your ticket online before your visit not only helps you save time but also allows you to choose an entry slot according to your convenience. Priority access to Park Güell. Entry to the Monumental Zone. 1 Jan to 30 Mar 2019: from 8:30 to 18:15 (last entry at 17:30). *16 Feb to 30 Mar 2019: from 8:30 to 19:00 (last entry at 18:00). 26 Aug to 26 Oct 2019: from 8:00 to 20:30 (last entry at 19:30). Children below the age of 7 enter for free. Youth and senior tickets (7-11 years) are available at a reduced price of €5.50. Please select the right profile type for your group during checkout. Also, ensure that you are carrying a valid ID of the members in your group if you select any reduced price tickets during checkout. Park Güell is located off Carrer d'Olot, Barcelona. You can take the Metro (Green Line, L3), with the closest stations being Lesseps or Vallcarca. Buses to Park Guell include those commuting on Lines H6, D40, 24 and 92. Taxi parking is available at Park Guell, 12 of which are on Carrer de Marianao and another on Carrer d'Olot. Parking for coach buses is available as well. There are three entrances that allow you to enter Park Guell and they are located at Sant Josep de la Muntanya (which you access by going up an escalator and even then it's pretty steep), Carrer de Larrard (the main entrance) and Carretera del Carmel, nº 23 (where the parking lot for coaches is located). If you wish to avoid a lot of climbing and stairs, take public transport (Bus #24) or a taxi to get to the entrance at Carretera del Carmel, which will be a mere 100 meters from the bus stop and the entrance to the Monumental zone is just 100 meters inside the park from the gates. This 200-meter walk is mostly flat. Exploring Park Güell involves a lot of walking, given that its architectural features include uneven paths and multiple steps. We recommend wearing comfortable walking shoes and carrying a bottle of water. For visitors with mobility problems, Park Güell offers two free wheelchairs for hire (subject to availability). The tourist coach car park has three places for people with reduced mobility. The Park is divided into the Monumental Zone and the Free Zone. The Free Zone is more like a garden while all the recognizable and famous portions of Park Guell are located in the Monumental Zone, which includes lots of uphill climbs and stairs so comfortable walking shoes are recommended. Access to the Monumental Core is regulated in order to renovate and preserve this portion of the Park. 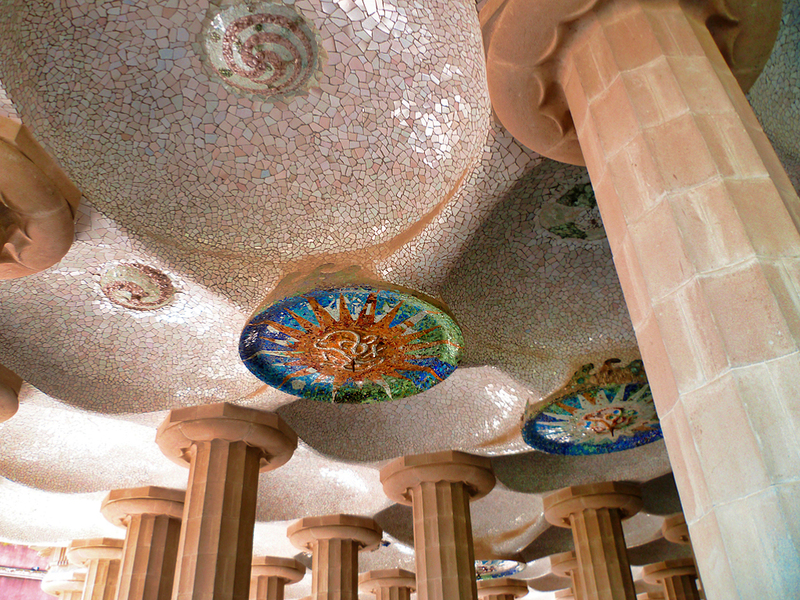 You will receive an email confirmation with your Park Güell tickets shortly. You may display your vouchers on your mobile phone at the security line, with valid photo ID.